I'd only just finished my colourful stripy crochet blanket when I stared on my next one. There's nothing like finishing a project for making me feel motivated to start another. Unfortunately the motivations doesn't always last that long which is why I have so many half finished projects lying around. I am trying to be strict with myself at the moment and concentrate on finishing these big projects. I'm only diverting to a smaller project if there is a deadline like my sisters birthday, or I need something more portable. I am finding this blanket a bit less fulfilling than the last one. I'm back to the greys again and although I love the finished projects in the grey colour scheme they aren't half as exciting to make as the colourful ones. However I need another blanket in the right colours for my living room because the Husbeast has claimed the stripy one as his and so I still haven't got my own! This blanket is also made up of squares. I love the way they look, I hate the seaming up. I think the blanket will take 170 squares which means a minimum of 340 ends to sew in (not including the border) and 153 seams to sew up. 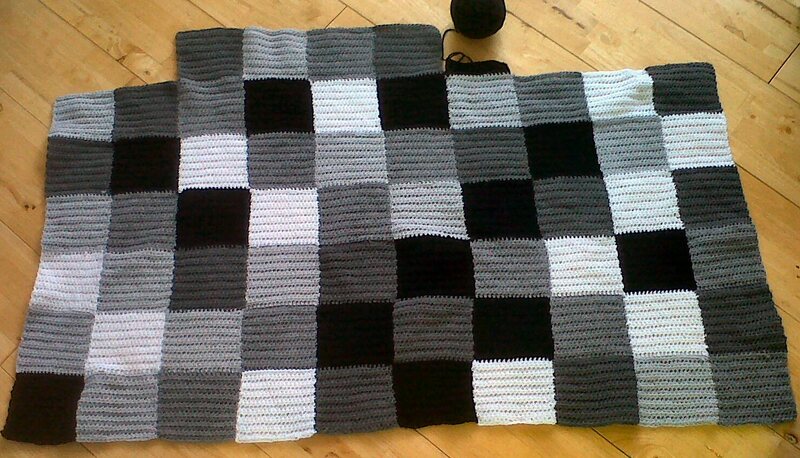 Not my idea of fun, however the blanket is growing and it looks good so I am determined to persevere. I am going along the blanket in rows however after I started the Husbeast pointed out I could have done it in columns and sewn up the long seams at the end. So yesterday when I was feeling a bit sorry for myself because my hip was hurting, I made a sneaky detour onto the coloured squares blanket which was going to be my next project. I can't believe I managed to get a whole column done which means if you don't count the bored I am a tenth of the way through the blanket. Not bad for a days work. Normally I wouldn't have got this much done, but lots of sitting and lying around feeling sorry for myself meant extra time to crochet so it wasn't all bad. The downside to this method is that there will be lots of seaming and sewing in ends at the end of the blanket which I will hate and probably curse myself for doing it this way. The upside is no seaming and sewing in as I go along which means it goes much quicker.